Meet Kepler-47d, a puffy planet that lies 3,340 light-years from Earth. 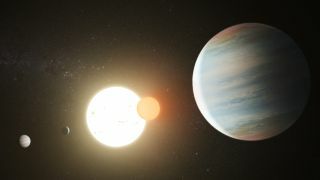 Artist's illustration of the three planets and two stars in the Kepler-47 system, which lies 3,340 light-years from Earth. The only known multiplanet "Tatooine" system just got even more interesting. A third world lurks in the two-star Kepler-47 system, and it's bigger than its two previously discovered siblings, a new study reports. "We certainly didn't expect it to be the largest planet in the system," study co-author William Welsh, an astronomer at San Diego State University (SDSU), said in a statement. "This was almost shocking." Kepler-47 is a roughly 3.5-billion-year-old system located 3,340 light-years from Earth. One of its stars is quite sunlike, but the other is considerably smaller, harboring just one-third the mass of our sun. The two stars orbit their common center of mass once every 7.45 Earth days. Artist's illustration of the three known planets of the Kepler-47 system. From left to right: Kepler-47b, the newfound Kepler-47d and Kepler-47c. Back in 2012, Welsh and his colleagues, led by fellow SDSU astronomer Jerome Orosz, announced the discovery of two planets circling the two stars. These worlds, Kepler-47b and Kepler-47c, both have two suns in their skies, just like Luke Skywalker's home planet of Tatooine in the "Star Wars" universe. The researchers made the discovery using the most prolific planet hunter of all time, NASA's Kepler space telescope. Kepler, which was declared dead this past fall, found alien worlds by the "transit method," noting the tiny brightness dips caused when planets cross their host stars' faces. Just before that 2012 paper was published, the team saw a hint of a third transit signal in Kepler's dataset, said Orosz, who also led the new study. Six months later, Kepler witnessed another transit, and the researchers were able to get a preliminary orbit for the candidate exoplanet. "Knowing the preliminary orbit, we went back in time and looked at the existing Kepler data and noticed very weak transit events," Orosz told Space.com. "By themselves, you wouldn't think they were much. But, given that they fit the pattern, it became clear that those were probably from the same planet." That planet is the newly announced Kepler-47d, which is about 7 times bigger than Earth. That's considerably larger than Kepler-47b and c, which are 3.1 and 4.7 times wider than our planet, respectively. Kepler-47b and c complete one lap around the circumbinary system every 49 and 303 Earth days, respectively. Kepler-47d's orbital period is 187 Earth days, which means it's the middle planet. And that came as a surprise; the team thought any additional planets in the system would probably be exterior to Kepler-47c. Orbital diagram of the Kepler-47 system. These three alien worlds are unlike anything in our own backyard, Orosz said: They're much less dense than Saturn, which is the puffiest planet in our solar system. Such extreme puffiness is common for scorching "hot Jupiter" alien worlds, which circle their host stars very tightly, the researchers said. But it's unusual for relatively temperate planets such as the Kepler-47 trio, whose average temperatures are thought to be about minus 26 degrees Fahrenheit (minus 32 degrees Celsius; Kepler-47c), 50 F (10 C; Kepler-47d) and 336 F (150 C; Kepler-47b). Two-star systems are often quite dynamic, with the planets' orbital paths shifting over time as they're tugged to and fro by their two host stars. Indeed, the discovery of Kepler-47d was aided by such a shift; the planet's orbital plane became more aligned over time with Kepler's line of sight, increasing the strength of the transit signal. But such dynamism doesn't mean the three Kepler-47 worlds will soon be scattered into the dark depths of interstellar space. They've survived for about 3.5 billion years, after all (assuming all three are native to the system). And, Orosz said, "based on numerical simulations, it seems like it's a pretty robustly stable system." The paper also "builds on one of Kepler's most interesting discoveries: that systems of closely packed, low-density planets are extremely common in our galaxy," University of California, Santa Cruz astronomer Jonathan Fortney, who was not part of the research team, said in the same statement. "Kepler-47 shows that whatever process forms these planets — an outcome that did not happen in our solar system — is common to single-star and circumbinary planetary systems," Fortney added. Editor's note: The original version of this story incorrectly stated that Kepler-47d's orbital period is 87 Earth days. It is actually 187 days.